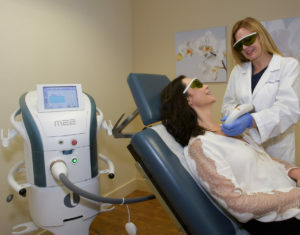 Deborah H. Atkin, M.D.—our board-certified dermatologist in Del Mar—can use state-of-the-art light therapy to address a number of issues you may be having with your skin. Intense Pulsed Light technology is a treatment breakthrough that can correct a variety of benign skin conditions. The light used in IPL treatments is filtered to remove ultraviolet frequencies preventing UV damage to the skin. IPL works to rejuvenate damaged skin leaving you with a healthier, younger-looking appearance. 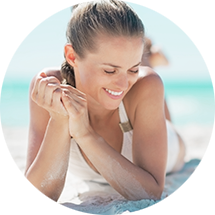 Learn more about the IPL™ Quantum SR, and please contact our practice to schedule a consultation for IPL (Intense Pulsed Light) therapy. Discomfort is extremely minimal. Patients are made comfortable with ice packs to cool and soothe the skin. After your IPL procedure, you may notice the brown pigment getting a bit more pronounced for a couple days, forming a slight crust on the surface. This is the pigment breaking up! Within a few short days the brown and red will appear lighter and your complexion with become clearer and more uniform. Length of Time for Procedure – IPL Photofacial treatment can typically be completed in about 30 minutes. You can have the procedure over your lunch hour! Who Will Perform This Procedure? – Our board-certified dermatologist, Deborah H. Atkin, M.D., will perform the IPL procedure. What is the Recovery Time? Depending on the size and number of areas being treated, there is typically little to no downtime associated with this procedure. Final Results of the Procedure – You should see reduction of red and brown spots and healthier-looking skin after a single treatment with IPL. Other Treatments or Skincare Products that May Improve My Result? –If you are treated with IPL Photofacial, you may also benefit from SkinMedica’s Vitamin C & E, Retinol Complex or SkinMedica Lytera Brightening Complex to further enhance results and reduce the appearance of discoloration and improve the signs of aging. To help you make the best decision for your needs and goals, Dr. Atkin has provided additional information about IPL. Talk to us today to find out more or to schedule a consultation. A mild amount of discomfort can be expected. Many patients prefer to use a topical anesthetic, which we can plan for when making the appointment. No, you may immediately return to your normal routine. You will be a little pink right after the procedure, an effect that may last a few hours. Tinted sunscreen or makeup can be applied right after treatment to cover any redness or darkened areas. days. Any dark spots treated may get darker and more noticeable for a few days, before flaking off. Photofacial results are long-lasting if you undergo the recommended number of treatments. During your consultation, Dr. Atkin with evaluate your skin and make her treatment recommendations. A skin regimen will be recommended to enhance and maintain results from your in-office treatments. A series of 2-3 are recommended on a typical patient; however, even one treatment can make a difference. IPL Photofacial rejuvenation is designed to combat signs of aging like hyperpigmentation (brown spots) and redness caused by rosacea, and it visibly reduces pore size. It stimulates the production of collagen in the skin for a smoother appearance. Do you have additional questions? Contact our office or schedule a consultation with Deborah H. Atkin, M.D..